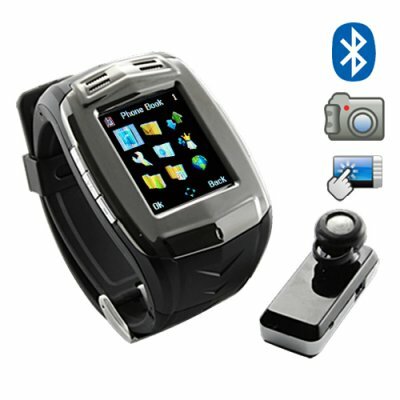 Successfully Added Quad Band Cell Phone Watch - Touch Screen + Bluetooth Watch to your Shopping Cart. Newly updated version of our popular four band GSM mobile phone watch with beautiful 1.5 inch touchscreen. This is a fully functional unlocked GSM mobile phone with a rich color 1.5 inch display, built in multimedia features, Bluetooth, and rich selection of PDA type software tools. What could be better than calling friends from your wristwatch? With any GSM SIM card inserted, this digital watch now becomes a power house of a cellphone in addition to being a great multimedia phone (and convenient personal organizer). Calls are simple with the supplied Bluetooth headset, or by using the watches built in microphone and speakers. The watch itself features a durable rubber blend strap, platinum metal color face and cast metal function buttons on the sides. Great for cyclists, commuters, and anyone who wants to stop carrying round bulky products in their pockets or backpack. This is a wonderful product for the internet storefront and re-sale markets. Already proven to be a great seller, order in bulk now to secure your stock and get the best wholesale prices and save on shipping. Proudly brought to you by the leaders in wholesale direct from China electronics, Chinavasion. Does this cellphone use TF cards? Yes, the phone comes with one microSD (TF card) included. How much would an extra battery cost? Nothing. This phone comes with two Li-ion batteries. Will this phone with my network carrier? YES. This is a four-band worldphone. If you have a SIM card for a GSM phone service provider then this phone will work for you. Does the phone come with a prepaid SIM card or contract? The phone does not come with a prepaid card. The phone is contract-free, it is fully unlocked so it can work with any GSM 2G service provider you choose. I would recommend this phone to anyone. It has all the features required and more. Service and delivery was speedy and outstanding. Thank you Chinavasion. on 2010-02-16 22:54:53 WORK IN AMERICA? This phone is what you dreamed about when you were a kid. It does everything you can want from a phone. Plays music and videos as well.